The term "hard bottom" refers to the ocean region close to shore, where wave action prevents the accumulation of muddy sediment that will create a soft bottom. Plants and animals living on or in the seafloor are called benthos. Benthic epifauna reside on or attach to a rocky substrate (surface). Benthic infauna bury themselves in soft sediments or bore into the rocky bottom or shells of other animals. Seaweeds, a kind of algae, anchor to the bottom with holdfasts. Unlike the roots of higher plants, holdfasts do not extract nutrients. Many seaweeds have pneumatocysts, gas-filled bladders that keep the photosynthetic parts of the seaweed in the photic zone, the near-surface layer of the ocean that light penetrates. All benthic animals are invertebrates. Although they inhabit all water depths, most are in the photic zone where light and nutrients are more abundant. Many benthic animals are sessile . Some are suspension feeders; they strain the fresh seawater brought in by waves, tides, or currents for plankton and other nutrients. Others wait for food to arrive. When a small fish swims against a sea anemone's tentacles, it is stunned by poisonous nematocysts and then dragged into the anemone's central mouth. Some benthic animals can move to pursue their prey, scavenge over the bottom, or graze on seaweed-covered rocks. Starfish crawl on tube feet over a shellfish or sea urchin; they pry apart the shell with their arms, extrude their stomach into the prey's shell, and begin digestion. Many benthic animals exist for part of their life cycle as tiny planktonic larvae, drifting with the water to colonize new areas. Benthic epifauna have enormous species diversity, reflecting the diversity in the benthic environment. In the intertidal—between the highest high and the lowest low tides—small distances bring large variations in substrate, temperature, salinity, moisture, pH level, wave action, dissolved oxygen, and food supply. Organisms at the top must contend with weather, predators from land, crashing waves, and an occasional influx of fresh water from storms. Organisms at the bottom face ocean predators and sometimes land predators, waves, weather, and drying out. For protection against predators and desiccation , the animals of the intertidal have shells (clams and barnacles) or exoskeletons (crabs and lobsters), or they appear as crusts on rocks (lichens and algae). Sea anemones huddle together to conserve moisture, and segmented worms and crabs retreat into mussel beds or rocks. 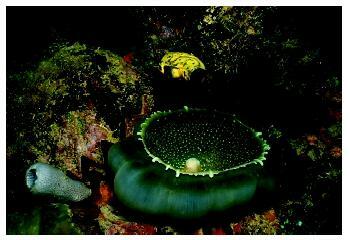 The anemone, tunicate, oyster, and sponge are examples of benthic fauna at the bottom of a lagoon in the Truk Islands. For protection against waves and tides, intertidal organisms attach to rocks with holdfasts (seaweed), cement (barnacles), threads (mussels), or arms (starfish). Snails squeeze a muscular foot tightly into a rock and retreat into their shells. The rocky intertidal has been the site of important ecological studies. In the rocky intertidal of Washington state, the top carnivore is the starfish Pisaster ochraceus. Removal of the starfish caused a decline in the number of species from fifteen to eight, including an enormous increase in the population of the mussel Mytelus edulis, the starfish's favorite prey. Pisaster ochraceus is therefore a keystone predator in its community; by limiting the size of mussel's population, it clears out space for other species. Keystone predators are often at a high risk for extinction since they are often high in the food chain and sparsely distributed. Paine, Robert T. Marine Rocky Shores and Community Ecology: An Experimentalist's Perspective, Excellence in Ecology Series, Book 4. Ecology Institute, 1994. <http://www.int-res.com/eebooks/index.html> .